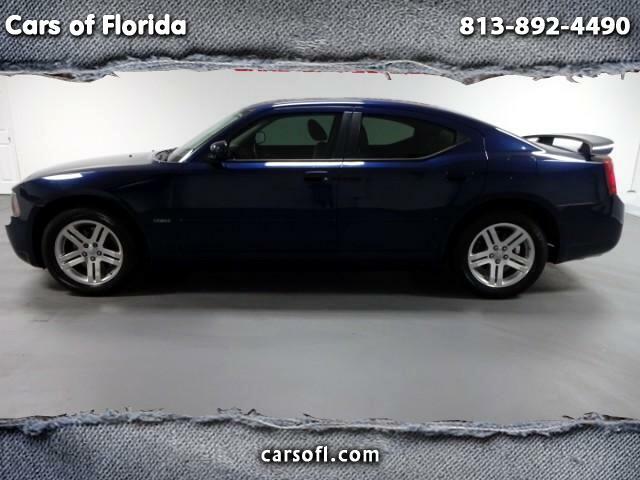 Cars of Florida is proud to announce this 2006 Dodge Charger R/T. This vehicle has only 90k miles and NO ACCIDENTS or prior paint work on the Carfax. Everything works top tier! Sunroof, telescopic steering wheel, all books and manuals and beautiful loud crisp exhaust note! Powerful 5.7L V8 HEMI has this vehicle providing amazing output power and torque. 17 city/24 Highway fuel economy still makes this vehicle amazing for everyday commutes! Never experience a boring drive ever! Great for extended trips! Tons of room and tons of power! You will be impressed with the presentation of this 2006 R/T! WILL NOT FIND A CLEANER LINEUP OF DODGE CHARGERS! We have three to choose from in all assorted colors! Every vehicle comes with a full complimentary inspection and detail! Come visit our lovely facility and fall in love with our inventory! We have something for everyone! Located right across from Toyota of Tampa Bay! 1136 E. Fletcher Avenue!